Choosing the right bird feeder is about a bit more than convenience. The feeder contributes to the overall appearance of the backyard and many people are primarily concerned about uniqueness. Fortunately, manufacturers have responded to that demand. Research reveals there are numerous unorthodox designs and bird feeder types that correspond to the needs of even the most eccentric individuals. If you’re looking for something unconventional, the following list of unusual bird feeders will give you some great ideas. The design of this feeder is far from eccentric but the decorations make it look a lot more like a beautiful garden accessory. Perky-Pet 305 looks a lot like a lantern and the oriental motifs make it perfect for the execution of an intricate or rustic landscaping idea. The gold rustic finish makes the feeder look like something than an archaeologist would uncover after days of intense excavations. The feeder is treated with powerful UV inhibitors that protect the gold finish and keep the item in a good condition for years. The Basketweave 2 Hummingbird Feeder is made from recycled glass, so it will certainly appeal to the environment-conscious individuals. At the same time, it comes with a truly intriguing design that’s different from the typical saucer or inverted bottle. The design is inspired by Depression Glass of the 1930s. The two bottles have intricate designs covering all of their sides. These fit into a metal basket that comes with individual perches for hummingbirds to rest on. Several ports are available, allowing numerous hummingbirds to feed at the same time. Two red floral designs (hand-blown glass) decorate the ports. They are removable for easier cleaning. People having a bit more eccentric aesthetic sense will probably love this item. 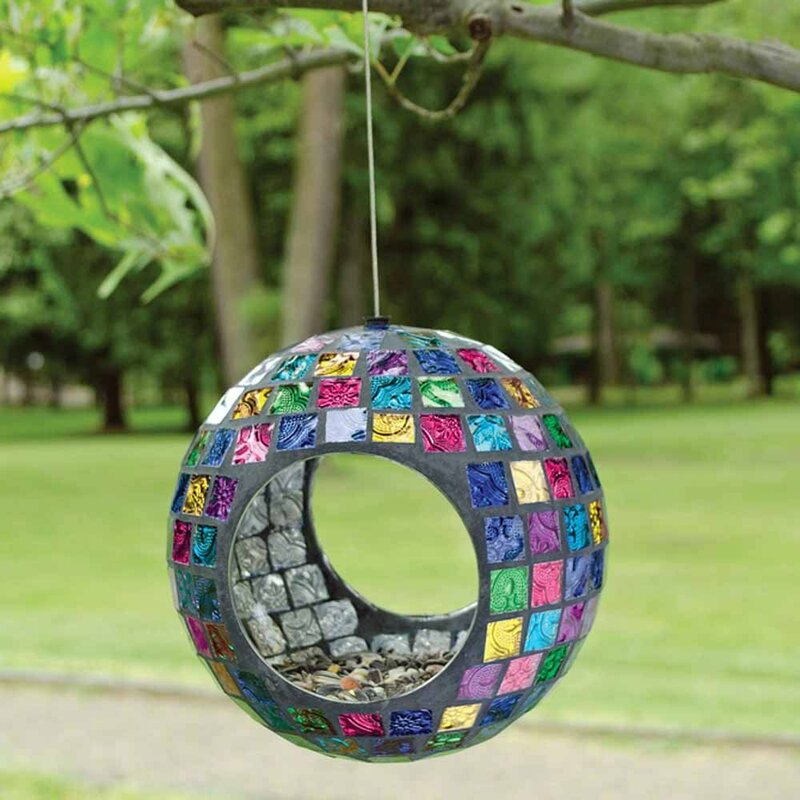 The mosaic glass feeder is very colorful, which attracts many different bird species. At the same time, the design is unobtrusive and elegant (a very difficult balance to achieve). The mosaic-like pieces are made of colored glass. Food is placed in the interior part of the circle. It also provides a place for birds to rest in while enjoying their seeds. The design in itself isn’t that innovative – it’s actually quite practical. The decorative elements, however, make the feeder stand out and turn it in a central piece for every backyard. 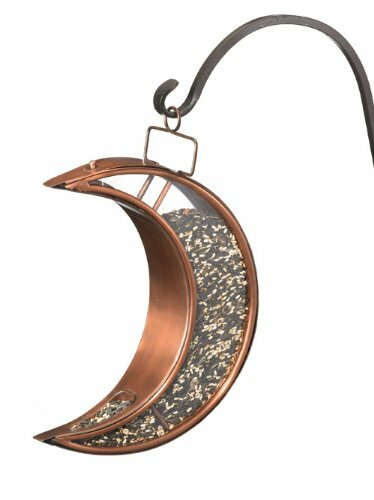 The name says it all – this wild bird feeder is shaped like a moon crescent. The Good Directions Venetian Bronze feeder features a beautiful Venetian bronze finish that will look beautiful, regardless of the landscaping decisions you’ve made. 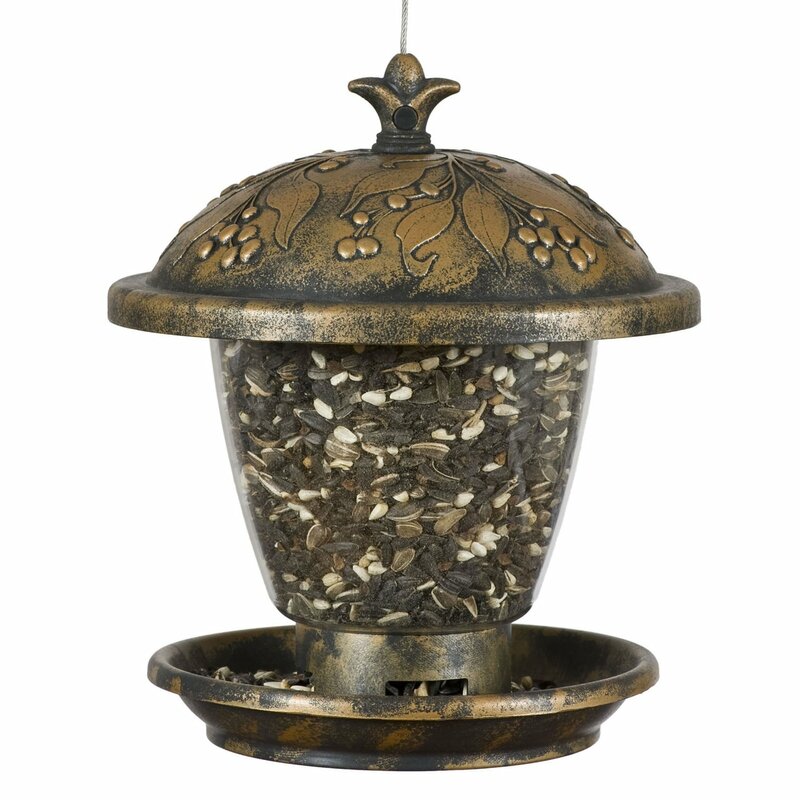 The feeder can hold up to four pounds of seeds and the shape encourages birds to perch on the crescent and rest. 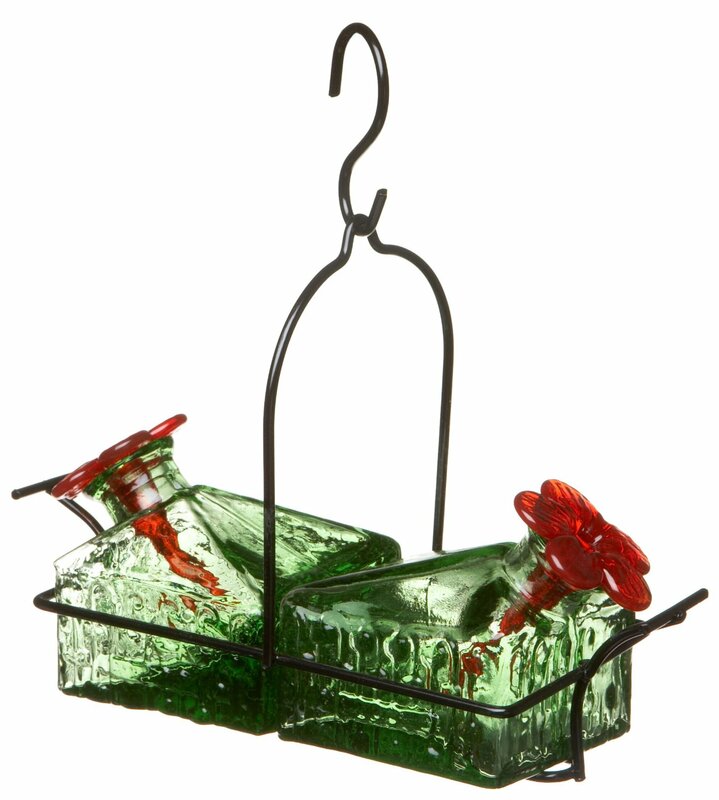 An easy to hang item, this feeder measures 17 by 11 by three inches. The sides of the crescent moon are clear, making it easy to keep track of the seed quantity and refill the feeder when necessary. Good Directions is a company that specializes in unusual designs. There are similar heart-shaped and circular feeders. 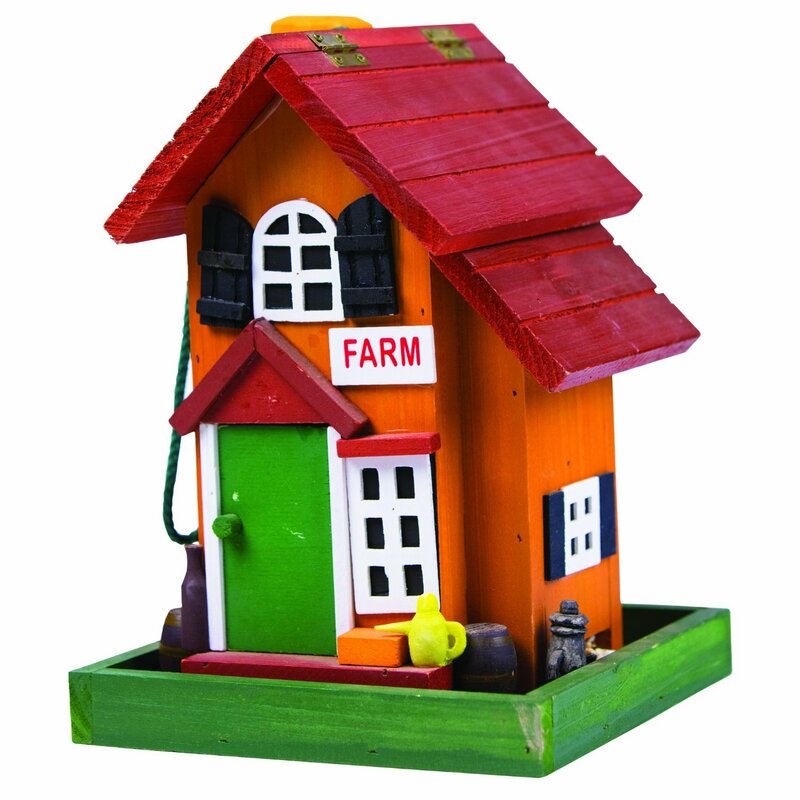 Could anything be more adorable than a bird feeder that looks like a miniature, colorful farmhouse? Best Home Products has designed one such attractive item made of natural fir wood. The realistic farmhouse feeder measures seven by seven by 9.5 inches. The colorful finish makes the feeder attractive and it also protects the wood from environmental influences. The roof can be lifted to enable cleaning and easy refills. A specialized dispenser is also incorporated in the design to give birds access to just enough seeds. 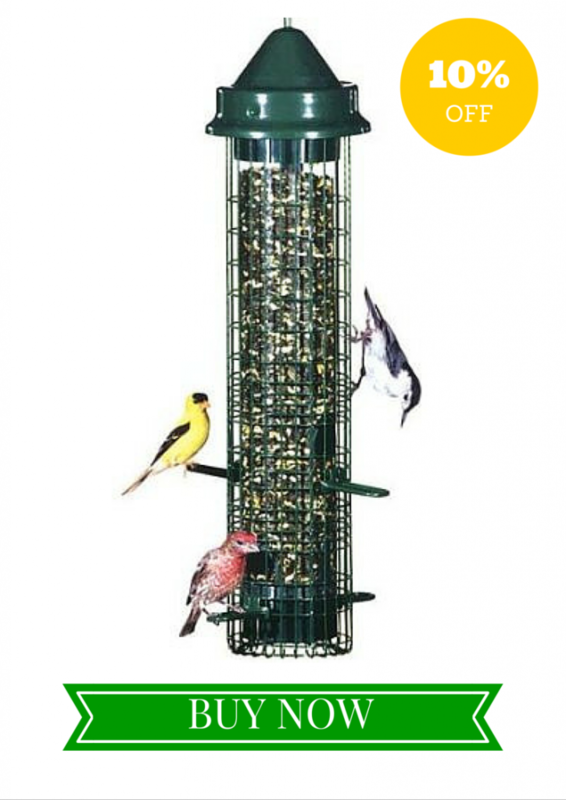 The Best Home Products Country Living Design Feeder holds up to six cups of seeds and nuts. It can be suspended or placed on a flat surface – birds will be drawn to it regardless of the placement.